I once created a cooking class, called 'Zen in the Kitchen'. Then wrote a book called the same. Then started the group with that name and the blog came after. All this happened in Turkish. Now is the time for the English version of it. Let's see what will cook here! This morning, I got up early. Even if it wasn’t cold outside, I decided to stay in bed and share the joy of birds. I decided if I stay in bed and keep quiet, I wouldn’t disturb their morning ritual. 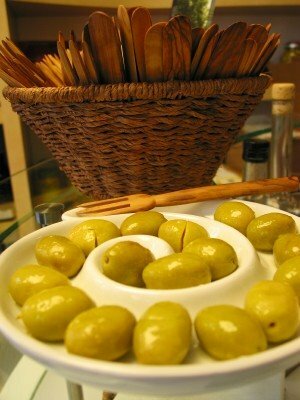 and my green olives would be a perfect match for a simit. Unfortunately when I get dressed and reach to the balcony, he was walking away. I thought another one would come but no, none came after him. So I had to go to the local market to buy two simits. One for me, one for mom. I prepared the tea, cut the tomatoes and prepared the rest of the breakfast. Breakfast is important for us, Turks. We want our tea (not a teabag, real, brewed tea for our breakfast. One glass wouldn’t be enough. We don’t enjoy large mugs for tea. It should be glass with a thin belly which keeps the tea hot. With tea, cheeses, butter, olives and jams are served. At times (depending on the season) tomatoes, cucumbers, peppers, even parsley and fresh greens are added. 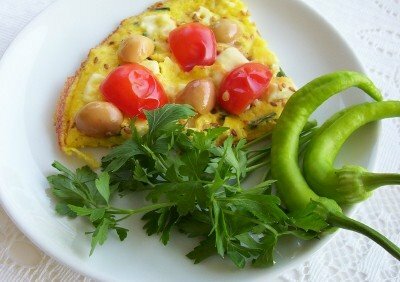 Omlette is not a must but be present on the weekend breakfasts. It could be eggs with ‘sucuk’ too. Sucuk is similar to sausage in a way. Ground meat mixed with some spices and garlic is filled in dried, cleaned intestines and let be dried for sometime. It used to be made at home in the past. Some families still make it I guess but it’s not made at our house anymore. I don’t eat it since I don’t eat meat but ‘sucuk’ is a beloved breakfast companion for many Turks. 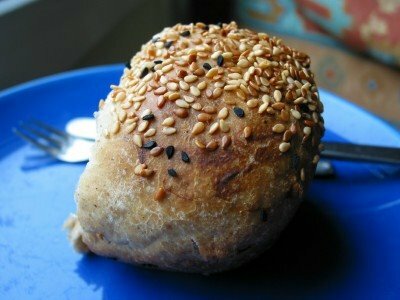 Breakfasts won’t be ready without breads. It could be homemade bread or bread from the baker. It could be white and sponge like or brown and tough. It depends on your taste and decision but we love bread! 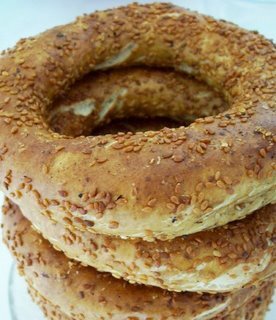 Yes, we may prefer ‘simit’ to bread at times but we don’t have simit for breakfast everyday, don’t worry. Were breakfasts be like that fifty years ago? 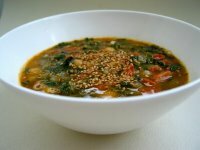 No, soups would have been eaten in many households. 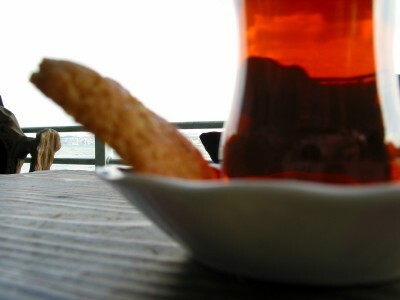 With a ‘tarhana’ or ‘mercimek çorbasi’ (lentil soup), homemade filo pastry would be served. Cheese? Yes, at some houses. 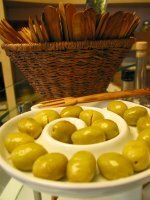 Olives and oliveoil? Yes, if you live in the Aegean region. Butter and jam? Not jam at so many places but tahini and pekmez (grape molasses) mixture would be great for winter! This pastry is made by my friend Sema few weeks ago for breakfast. It’s called ‘cantik’ and is made by Tatars mostly. 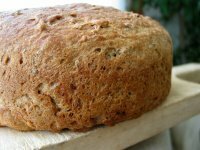 It’s filled with mashed and spiced potatoes (normally a meat filling is preferred) and made with wholewheat flour. It’s made with white flour by many women. This actually was a lunch photo but it could be eaten for breakfast too. 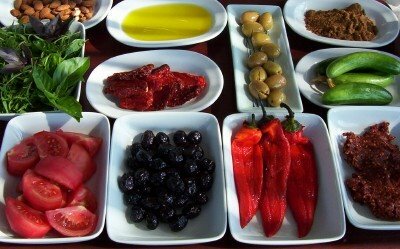 I took this last summer when we visited an oliveoil factory in Edremit (a Northeastern Aegean town). 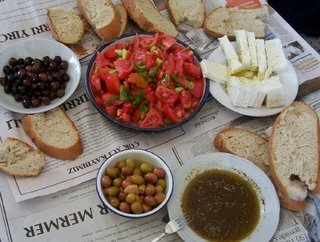 We had olives and oliveoil, the bread came from a nearby village, cheese from around and tomates were from the garden. It was a great lunch if you ask me. 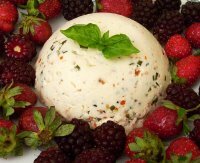 I could eat it for 3 times a day in summer! WOULD YOU LIKE TO SHARE YOUR OWN BREAKFAST IDEAS WITH US?